Nachstehend finden Sie eine Liste mit Exkursionen, die Sie über Zakros Tours buchen können. Wir können Exkursionen mit unseren Bussen anbieten – für Einzelpersonen oder Gruppen. Neben den unten aufgeführten Touren stellen wir auch kundenspezifische Exkursionen bereit und organisieren Gruppentransfers oder die Beförderung von Gruppen auf Kreta. 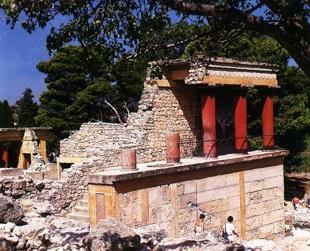 No stay is complete without a visit to the fabulous site of Knossos. 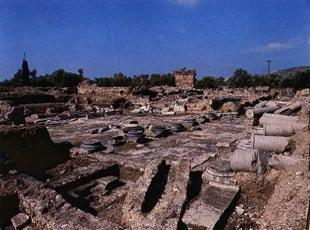 This ancient Minoan palace with its 1400 rooms dates back some 4000 years. The palace was discovered by the English archeologist Sir Arthur Evans and has been lovingly restored. Knossos was the home of the legendary King Minos and was believed to incorporate the Labyrinth where the gruesome beast the Minotaur was slain. Visit the queen's throne room, where the throne was found intact and still sits resplendent as it has for thousands of years. After our guided tour around Knossos with our professional guide, we drive into Heraklion for a visit to the archeological museum and its famous collection of Minoan relics and artifacts. Whilst in Heraklion there will be time to visit the market, to shop with the locals and have lunch. For a taste of how the Greeks enjoy their nights out, join us for a spectacular village fiesta. You will be welcomed at the village with a glass of raki (not for the faint hearted), before being seated for dinner in traditional Cretan style at long tables inside the tavern. Delicious food, including local dishes and unlimited wine from the barrel, will satisfy your appetite and thirst. The superb dancing and musical programme is the best on the island. 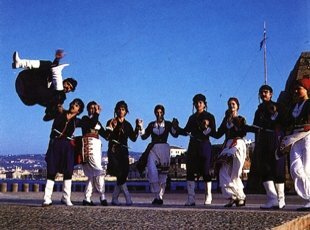 The colorful costumes, the fire dance and of course a very special routine of Zorba the Greek will entertain people of all ages. All this served up with true Cretan hospitality. Your chance to see West Crete should not be missed. Beautiful, wild and rugged, the landscape is completely different from the East of the island. We make a number of stops, including the university town of Rethymnon with its Turkish minarets, Venetian fortress and pretty harbor. On to Chania, the former capital of Crete, where we stop for lunch. Here you will have the opportunity to explore the fascinating narrow cobbled streets around the Venetian harbor and to visit the famous leather market, which is built in the shape of a cross and where the locals come to do their shopping. Lastly we continue onto Souda bay, the site of the British war cemetery. This immaculately kept cemetery lies in piece and beauty, as a constant reminder of the brave young souls who lost their lives. This is a breathtaking drive with panoramic views along the Eastern coastline. Winding our way across the mountains, on our way to the famous "Bounty Beach", we take a break for refreshments at Sitia. This charming port town is lined with seafront taverns and has a pretty harbor, where you can sit and take a welcome rest. With its thousands of palm trees, Vai offers a truly tropical feeling. Here you can have your lunch, relax and swim in the crystal clear waters imagining you are on a tropical island! Become Robinson Crusoe for the day on the deserted island of Chrissi or "Gold Island". This exceptional outing begins with a picturesque drive to the south coast. From Ierapetra, a local boat ride across the azure waters of the Libyan Sea takes us to the island of Chrissi. During the crossing you can often observe dolphins in their natural habitat, seemingly showing off as they swim and leap into the air just a few meters from the boat. 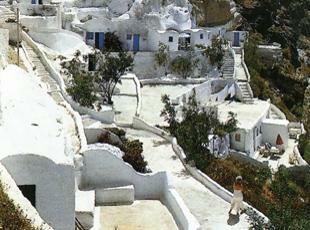 Chrissi Island is the southernmost point in Europe and the hottest. Just 5km long, this semi-tropical paradise has fantastic beaches. Those in the South are of white sand, and there is a spectacular fossilized shell beach to the North. 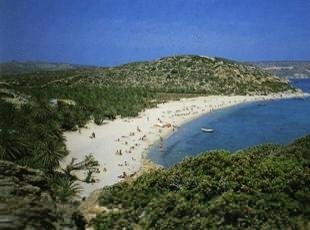 The abundance of trees provides welcome shade and the two tavernas (one at each end of the island) serve cold drinks and food. A perfect day of swimming, sunbathin and relaxation away from it all. A truly relaxing day out for all. A chance to look around Agios Nikolaos with its bottomless lake, or Elounda, a charming fishing village where the BBC filmed the popular series "Who pays the Ferryman?" Soak up the sunshine on board boat as we sail gently towards one of Spinalonga's most secluded coves. A delicious BBQ lunch is prepared whilst we while away the hours swimming and sunbathing. You may like to dive into the crystal clear waters from the side of the boat. 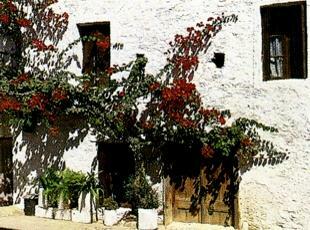 A guided tour around the unique island of Spinalonga creates a sense of mystery and adds interest to the day. You will have the chance to wander around the battlements of the Venetian fortress and uncover a fascinating part of the island's history. Stroll through the crumbling town of the former leper colony, where you can still see the shops and houses, hospital, disinfecting room and churches once used by the unfortunate inhabitants. Gortys, a Graeco - Roman city and Phaistos, a Minoan palace that occupies a superb position overlooking the plain of Messara. There is an opportunity for lunch and swimming. You may then like to take a closer look at the prehistoric man made caves on the beach, at the delightful resort of Matala. 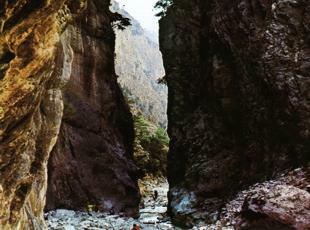 A stunning 18km long walk through the longest and most beautiful gorge in Europe, which is one of Greece's national parks. Our early morning route takes us along the north coast of the island through Rethymnon and Chania, before we begin the climb towards Omalos, which is 4000 feet above sea level. This is where our walk begins, as we descend the wooden steps into the gorge. The path takes us through varying widths of the gorge (2-40 meters), the sides of which are between 250 and 600 meters high. The route reveals a natural masterpiece of sheer rock faces, pine clad valleys, streams, waterfalls and breathtaking views. Enjoy a well-earned rest at the bottom of the gorge with a dip in the warm Libyan Sea and a bite to eat, before boarding the boat for Chora Sfakion where our coach will be waiting for the journey back to your resort. Sit back in comfort and enjoy some of the most panoramic and breathtaking rugged mountain scenery, leading to the green and fertile farmland of the Lassithi Plateau. 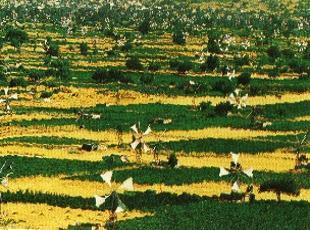 The plateau is the site of an astonishing 10.000 windmills, once used for irrigation purposes during the dry season. Continuing our peaceful drive through the villages, we make our way to the Dikti Cave, birthplace of the mythical Greek god Zeus, who was believed to be the king of all the gods. There is an opportunity to buy hand-woven Cretan rugs and other local wares from the villages. This luxury one-day Mediterranean cruise takes you to the magical island of Santorini, believed to be the lost City of Atlantis. Black sand and whitewashed houses, indigo sea and grey earth, green fields and petrified lava; no other place quite compares with the wild natural beauty of this volcanic island. The atmosphere will intoxicate you just as much as the taste of the heady local wine. The view from Thira, the town perched on top of sheer cliffs, will stay in your	memory long after your cruise to Santorini is over.